The Jersey Shore borough has been dry since 1940. Its residents might be able to change that. 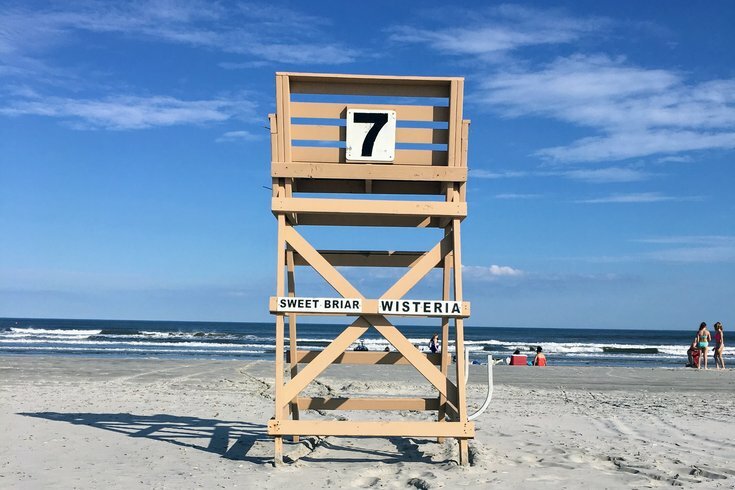 A lifeguard stand is seen on the beach between Wisteria and Sweetbriar roads in Wildwood Crest, New Jersey. The Borough of Wildwood Crest is asking for residents’ opinions on its status as a “dry” town, it announced Monday, as the borough considers ending its 69-year ban on alcohol sales. If a referendum allowing the sale of alcohol were to pass, the borough said, the issuing of one retail consumption license — to be used for a restaurant and/or bar — and one retail distribution license — to be used for a liquor store — within the borough’s limits would be permitted, but not required. Special event permitting could also be considered for certain cases, the borough said. The borough spans the width of the island east and west, and stretches from Cresse Avenue at the north end to Jefferson Avenue at the south. One restaurant selling alcohol, the Diamond Beach Cafe & Burger Bar, currently sits less than a full block from the borough limits in Lower Township. Residents interested in expressing opinions on overturning the ban of the sale of alcohol can attend the Wildwood Crest Board of Commissioners meetings, according to a release from the borough. A petition signed by at least 212 registered voters, in a borough of 3,176 residents, must be presented to the Board of Commissioners before it goes to a referendum. Before 1940, the borough says, two liquor licenses permitted alcohol sales in Wildwood Crest.